Chinese eggplant are bright purple, tubular shaped fruit (yes, fruit!) that is most commonly used in stir fries or deep fried and braised. It’s spongy flesh absorbs all the flavours of the sauces and provides a slight sweetness and creaminess to any dish it is used in. Chinese eggplant is a very versatile ingredient and can prepared in oodles of ways. A popular way to cook them is to deep fry or stir fry them but you can also braise them, stuff them, grill them, roast them and although I have never tried this – you could probably pickle them as well. OH! One of the cool things about Chinese eggplants is: you don’t need to salt them to remove the bitterness like you do with normal Italian eggplants. Chinese eggplants don’t have a bitterness to them so you can use them as is! Neat eh? You can occasionally find these at local grocery stores and gourmet specialty stores but you can almost always find them at Asian supermarkets. When you are picking them out at the grocery store, find firm ones with no brown blemishes or dents. The eggplant should have a smooth skin and be wrinkle free and a rich purple colour. Chinese eggplant has a slightly sweet flavour to it. When it is cooked, the flesh becomes almost creamy! Depending on how it’s cooked, the texture can be very different. Typically if heat is applied to it, it has a very soft and creamy texture. When cooking it, the flesh of the eggplant is almost like a sponge, so it absorbs the flavours and sauces of dishes very well and creates flavourful dishes. 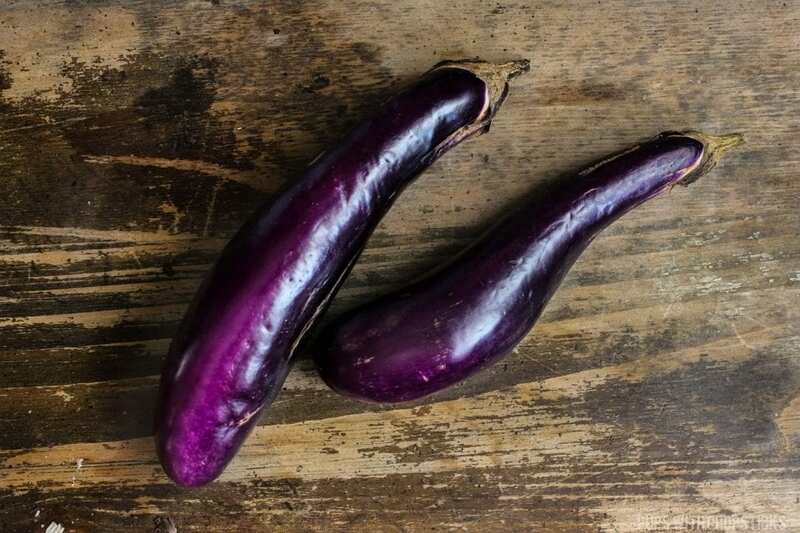 You can store eggplant in room temperature away from the sun. However if you live in a very hot area and your kitchen is usually on the hot side then store the eggplant in the fridge.